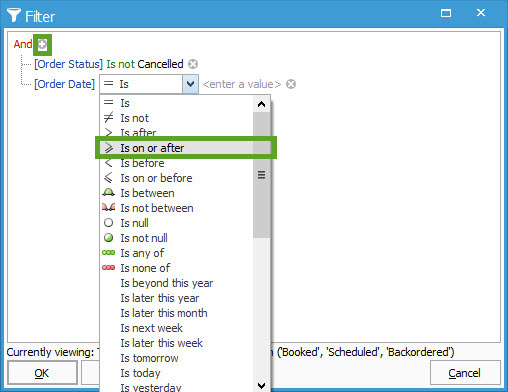 Within the Order Manager window, users have the option to filter the views by additional conditions. 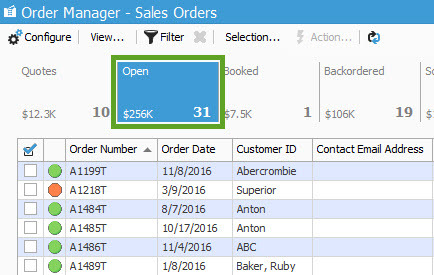 These filters don’t last beyond the time that the Order Manager window is open, but they can be useful to narrow down the data returned by the standard views. We’ll look over two quick filters in this article. The first will be a simple one condition filter, and the other will be a bit more complex to show how filters can be built. 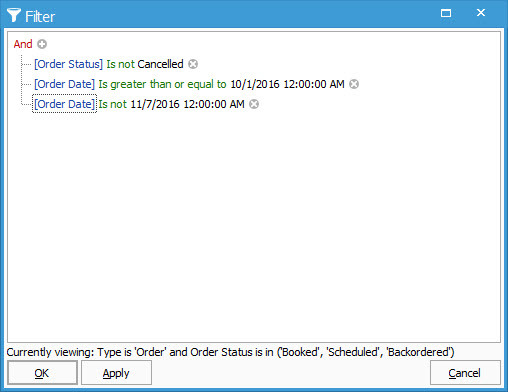 Step 1: Open the Order Manger and select the “Scheduled” button from the bar. Step 3: You’ll now be in the filter set up window. 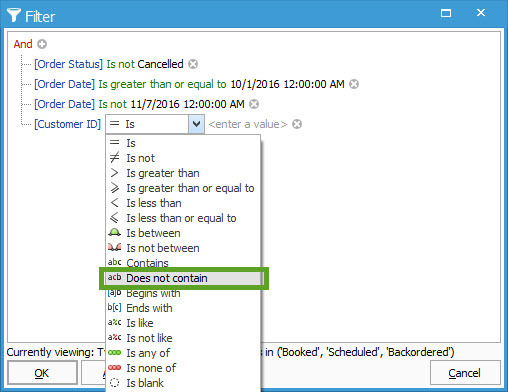 Here, we can add conditions to the filter to sort the data in our views. For now, we will click the + symbol next to the “And” criteria. 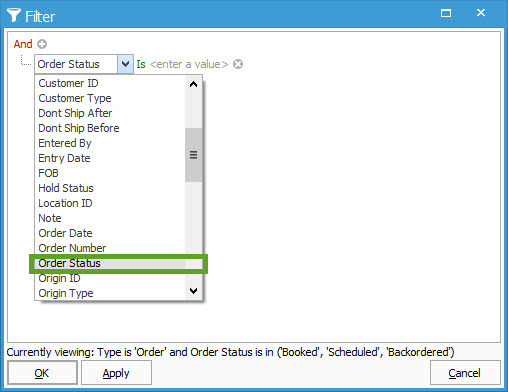 Step 4: Initially, it will default to the criteria of “Order Number is…”. We want to change this to be “Order Date is…”. 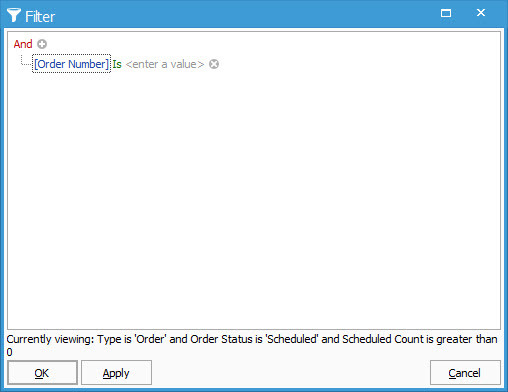 Step 5: Click on “Order Number” to make the drop down menu appear and select “Order Date” from the list. 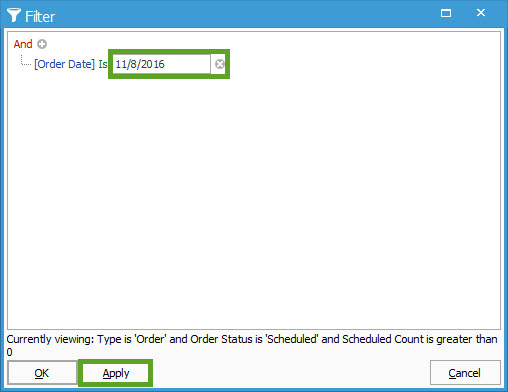 Step 6: Once selected, click on the <enter a value> field and type in the date of your choosing. For this case, we’ll choose 11/8/2016. After entering it, click “Apply” then “OK”. The filter will now be applied. Step 2: Next we will click on “Is” to change it to “Is not”. 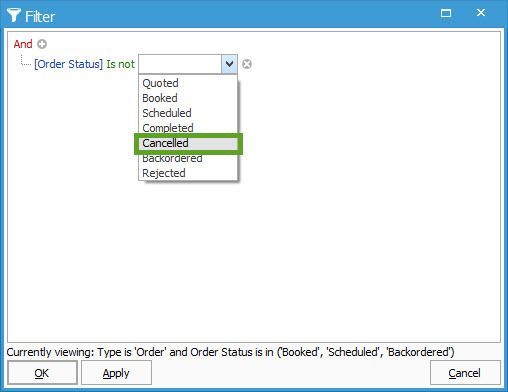 Step 3: We want to remove all “Cancelled” orders from the view, so we’ll put the status of “Cancelled” in the <enter a value> field by selecting it from the dropdown. 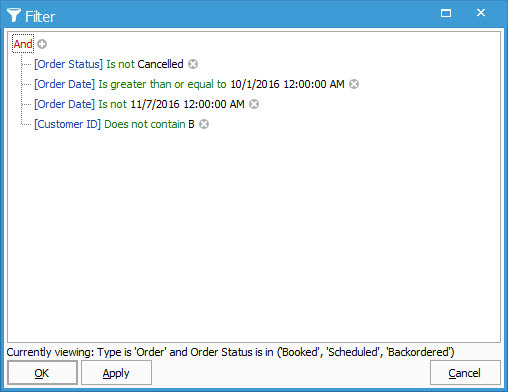 This tells the filter to bring up all orders where order status is not cancelled. Step 4: Let’s add a few more filters. In this case, let’s grab all orders where the order date is on or after 10/1/2016. 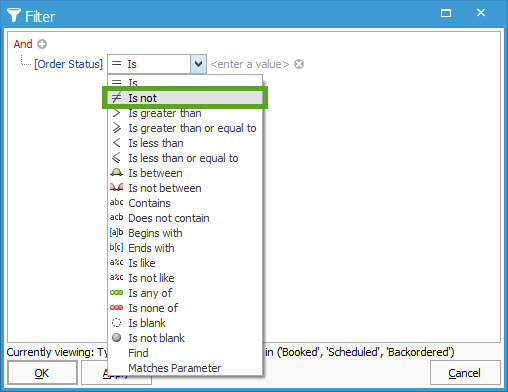 To add additional criteria to a filter, click the + symbol next to the “And” at the top. 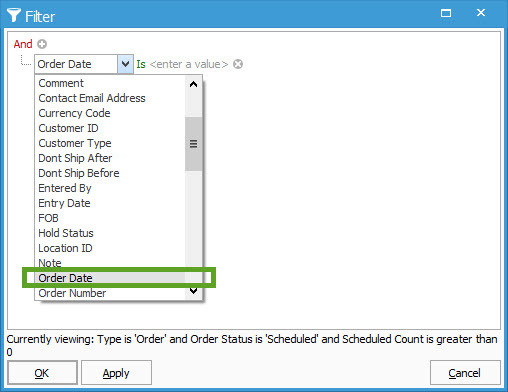 We’ll select “Order Date” as we did before, and then change “is” to be “Is on or after” from the drop down. Then add the date information as we did last time. Step 5: Let’s also remove any open orders with an order date of 11/7/2016. This will pull all orders on or after 10/1, but it will exclude any with an order date of 11/7. Step 6: Let’s add one more criteria. We’ll click the + and then swap out “Order number” to be “Customer ID”. We’ll also change out the “is” to be “Does not contain”. Step 7: In the <enter a value> field we will click once, then type in “B”. This will remove all orders from the list if their customer ID’s contain a “B” in them. Step 8: After entering in all of the above, click “Apply” and then “OK” to set the filter. There are many ways to use quick filters. This article covered some of the basics, but feel free to experiment and develop your own sets. Whenever you’re done using the filter, simply click the “X” next to the “Filter” icon to revert back to the default views or close the order manager window to reset it.